Outback mailman and star of 'Back of Beyond'. Esmond Gerald (Tom) Kruse, born at Waterloo on 28 August 1914, the son of Harry and Ida Kruse, conquered sand hills, sand and dust storms, flies and floods, swollen rivers and creeks, bugs and bogs and numerous mechanical breakdowns but delivered the mail without fail, although sometimes a little late. Between 1930 and 1960, for twenty years once a fortnight, through summer heat or rain, when Tom had the contract, never did the people along the Birdsville track go without their mail. Tom is, and was, an outback legend in his own time. His truck, a Leyland Badger built in 1936, gave up the ghost in 1957. After being abandoned in Sturt's Stony Desert more than 40 years ago, Tom's Badger has been restored and driven by 85 year old Tom for the last time to its permanent home at the Birdwood Motor Museum. 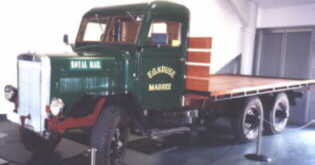 After this last run by Tom Kruse in October 1999, to deliver more than 7000 letters from all over the world, his truck is now housed at the Birdwood Museum. During that trip $12,000 was raised for the Royal Flying Doctor Service. Tom used to call at such places as Lake Harry, Dulkaninna, Cannuwaukaninna, Ooroowillanie, Mirra Mitta, Mulka Store, Burt's Hole, Mount Fitton, Alton Downs, Mount Gason, Roseberth, Goyder Lagoon, Kalamurina, Kopperamanna, Killalpaninna, Mungarannie, Clifton Hills, Pandie Pandie, New Well also known as by its Aboriginal name Mulkanundracooracooratarraninna, Lyndhurst, Glengyle, Durrie, Birdsville, Clayton Bore, Etadunna, Oodnadatta and numerous other places. Mail and other supplies for the people and stations along the track have been delivered since the late 1860s. The first government mail service was pioneered by Jack Hester in 1884 followed by a mail-passenger service opened in 1886 by August Helling, the son of a German migrant, using packhorses and buggy. From Birdsville it was George Roberts' job to get the mail to Cordillo Downs and Haddon Downs. Between 1926 and 1936 Harry Williams had the contract but from 1932 onwards it was his son George who did all the driving. Tom Kruse started work for Harry Ding of Yunta in 1934 when Ding bought John Penna's and Arthur Kruse's businesses at Yunta. Tom, a blacksmith's son from a family of 12, had started working for his older brother Arthur and later for John Penna at his general store and post office in Yunta delivering supplies to the local stations. He was only twenty-two but a seasoned outback driver when he first 'attacked the Birdsville Track' and inaugurated the Mail Service for Harry Ding on 1 January 1936. Still only little more than 'pads between bores', Tom, and his Aboriginal offsider Henry Butler, had to find their own way through, and over, sand hills and around bogs as the mail and goods, plus the occasional passengers, had to get through once a fortnight. Once Tom had to make a detour of more than twenty kilometres. The track was graded for the first time in 1957 for the Ampol car trial. On one of his first runs in 1936 Tom had to walk in 40 degrees heat to Mungerannie and back to Mulka for some assistance from Poddy Aiston to get a broken tailshaft fixed. Some of the well known drivers who worked for Harry Ding to get the mail to Birdsville were Ken Crombie of Mungerannie, Tom Robinson and Fred Teaque. In 1939 Tom helped with the supplies for Cecil Madigan who was the first European to cross the Simpson desert by camel. After his marriage to Valma Fuller of Yunta on 24 January 1942, Tom took his new wife to Marree and became resident branch manager for Ding at Marree and Lyndhurst. Round trips between Marree and Birdsville would normally take seven days but sometimes it took a lot longer. On one occasion he was away for six weeks. In 1947 Tom bought the Marree based business from Harry Ding and on 1 January 1948 Tom took on the Birdsville Mail contract on his own account and successfully owned and ran it for the next fifteen years until 1963 when he sold it to Pat and Ruth Smith of Quorn. In 1949 Tom had to use a barge to get the mail to the other side of the flooded Cooper and it was reported that he had great difficulty retaining his employees as conditions were so bad that they could not put up with the continuous problems and hard living. On 8 April 1949 Tom left Marree with 815 pounds of mail and got through the floods and back in seven days. On another trip Tom was not so fast. He got bogged at Pandie Pandie and had to be picked up by plane. During the Christmas Holiday of 1963 five members of the Page Family died in the same spot because of lack of petrol, water and the heat. As a result of the extensive flooding during 1948-49, the Beltana Pastoral Company asked for an aerial mail service but pilots often refused to land at waterlogged stations. The only one to get the mail through time and again was Tom. According to the people living along the track 'There would never be another mailman like Tom'. In 1950 the Postal Services admitted that Tom had performed a yeoman service in carrying out his contract since the country became flooded. In 1951 Tom decided to hand the driving of the mail to Monty Scobie who started in 1952 while Tom went dam excavating. His first job was at Moorayepe. Scobie drove for three years and was replaced by Vivian Oldfield, who did only one run and was in turn replaced by Max Bowden. In 1953 Tom retired from regular trips along the track and started an earthmoving and tank sinking business. His last trip to Birdsville was made in November 1963. Tom and his wife also starred in John Heyer's documentary 'Back of Beyond', a film, made in 1952, about the people and mail deliveries on the Birdsville Track. It won the Grand Prix at the International film festival of Venice in 1954. A year later, in the 1955 New Year Honours, Tom was awarded an MBE for 'services to the community in the outback risking his life on many occasions'. The Governor who had especially flown to Birdsville to present the MBE to Tom had to return with the decoration as Tom was stranded on the track somewhere, cut off by floodwaters. It was nearly a year later before Tom was able to receive his decoration, this time in Adelaide. In 1964 the Kruse family moved to Adelaide where Valma and the children settled. Tom stayed up north to look after his business sinking dams, road making for mining companies and heavy haulage. When his children got older, Valma was able to go and stay with Tom on many occasions. They celebrated their 60th wedding anniversary in 2002. Tom died 30 June 2011. Both Tom and Valma are buried at the Carlsruhe cemetery.